Healing Whiskers: Tumor Trooper Walk 2016: Where's the Froyo? 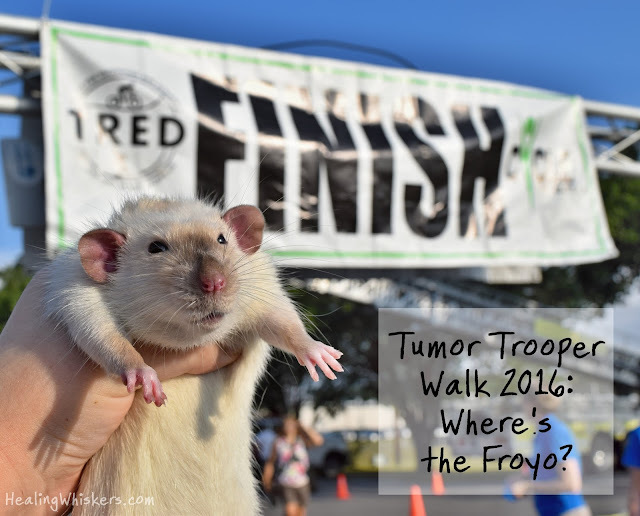 Tumor Trooper Walk 2016: Where's the Froyo? Jasper and I did the Tumor Trooper 1 mile walk this morning in Armuchee, Georgia! We came out to support a long time friend of mine and I thought it would be a perfect small outdoor event to help Jasper with his therapy work. We got mostly positive interactions and remarks from people. Some wondered what he was from afar (which I am okay with..not gonna force rats on people!). Kids, older people, male, female, a good mix! I took along his basket which is his safe place/also a litter box if needed (He is being trained on paper towels so there are many layers at the bottom). I also brought my camera (of course) and a water bottle holder from PawZaar that has little compartments where I put some puffed snacks. "Get in my tummy, chicken biscuit!" Overall he did okay, he was pretty fidgety though. He is 3 months old so he is still young and there were a lot of new smells so I am okay with this. I know he will get calmer as he gets older. I did forget to bring my towel which he is supposed to sit on when he goes on people's shoulders, so I limited that and just let people pet him. He REALLY wanted to climb up on people, but I need to work on him not automatically doing that because not everyone wants to make that next step. We also had no seizures! If he does get one we have to get bloodwork right after and even then we might not figure out why he gets them. So I am so very thankful he did well today and just ended up very sleepy on the way back home. I was supposed to be at a therapy animal workshop all day today, but it got cancelled cause I was the only one signed up. Will just have to get that done before he can get evaluated, but we have later this fall/winter when he would be old enough anyways. Don't worry, we will have a blog post soon with all the requirements of a therapy rat! In the meantime, check out this gif of Jasper going into Scoop's head! (Scoop is the mascot for Sweet Frog which is a frozen yogurt shop). We actually had to go and remove his head to get Jasper out. He popped his little rascally nose out a couple of times but went right back in. 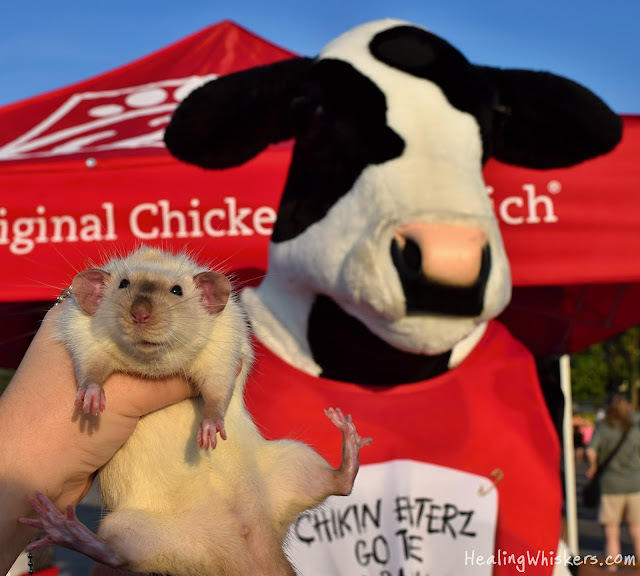 Thankfully the mascot guy didn't freak out, but it could have been bad if they didn't like rats, haha. Lesson learned! Do you bring your pet to walking events?